OctaMic XTC, Solid-State Pre-amp from RME Audio in the OctaMic series. RME Audio announces the release of its OctaMic XTC, an 8-channel preamp that was introduced at Musikmesse this year. The OctaMic XTC is a multifunction preamp that features 8 mic/line preamps, four of which can be switched to Hi-Z and the four others are equipped with a Pad. 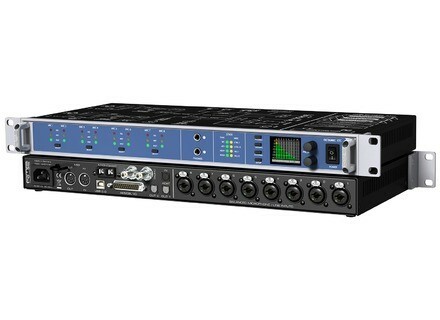 The 19" 1U rack module also includes two stereo analog outputs, 4 AES/EBU digital inputs and outputs, as well as MADI, ADAT (2 S/MUX out) and MIDI DIN I/O. 2 USB MIDI ports are also on the menu, along with MIDI over MADI. You can also use the OctaMic XTC as a 24-bit/192kHz A/D and D/D converter or as a standalone recording interface to Apple OS and iOS. The OctaMic XTC offers several routing and monitoring options, including to the two headphone outputs. You'll also find a color display, presets, and the preamp is compatible with the TotalMix FX software. The OctaMic XTC retails in Europe for 1763.87€ excl. VAT. More info soon at www.rme-audio.de and at your local retailer. Allen & Heath launches GLD OneMix for iPad Allen & Heath has released on the AppStore a simplified version of its GLD Remote control app for the iPad and GLD digital mixers. Overstrayer introduces the AMPEQ-02 Overstrayer announces that its new AMPEQ-02 rackable channel strip is on its way to the retailers.